As Wenger himself said, “Football is an art like dancing is an art – but only when it’s well done does it become an art.” When Wenger called time on his legendary spell in North London last season, the Arsenal front office needed to find a manager who could give the club a breath of fresh air, but one who could carry on that tradition of entertaining football. Even the most staunch Wenger supporters can admit that there was a sense of stagnation in the club over the last few years. Wenger is a legend of the game, but it was clearly time to move on. In the end, after turning down Mikel Arteta, the board settled on former Paris Saint-Germain boss Unai Emery, though his appointment was met with a level of skepticism. Emery won three straight Europa League trophies in Sevilla, but he failed to progress past the Champions League round of 16 at Paris Saint-Germain, blowing a 4-0 lead to Barcelona in 2017 and losing 5-2 on aggregate to Real Madrid in 2018. While he stabilized Valencia and achieved three consecutive 3rd-place finishes, he was an abject failure with Spartak Moscow. It is a hot-and-cold CV: for every success story Emery has had (Carlos Bacca at Sevilla), he’s had a blatant failure to go along with it (Isco Alarcón at Valencia). Still, in becoming the second Arsenal manager in the Emirates era, many viewed him as an exciting change of paste, one that Arsenal desperately needed. To get the job, he had reportedly compiled an in-depth analysis of the squad, he wanted Aaron Ramsey to be the focal point of the team, and he promised attacking football. Fast forward eight months later: Ramsey is set to leave on a free transfer this summer, Arsenal’s brand of football has been slow-paced and unimaginative, and Mesut Özil, the highest earner at the club, as well as the best playmaker on the team, is being frozen out of the first team. Granted, there’s still three months left of the season, but where has the progress been? In Emery’s defense, he has improved the likes of Alex Iwobi, Sead Kolašinac, Rob Holding, and Hector Bellerín. Unfortunately, the latter two’s seasons were cut short by injuries, but when they were in the side, Sokratis had a competent partner in central defense, while Kolašinac had a stellar fullback opposite his side. While Kolašinac boasts the attacking qualities of Bellerín, he lacks the Spaniard’s concentration and defensive assurance, and with Stephan Lichtsteiner instead of Bellerín, Arsenal’s defense has been a collective mess. And as much as he has improved his game this season, Iwobi still remains incredibly inconsistent. All things considered, it isn’t the best track record, but it isn’t terrible either. However, the biggest question mark of his man management so far has been freezing out Özil, just months after the club tied him down with a blockbuster contract. It is known that Emery struggled to control the dressing room in Paris, with Neymar and Dani Alves giving him the most trouble. One incident that comes to mind is the Neymar-Cavani row over a penalty kick. Both the Brazilian and Uruguayan fought for the ball to take the penalty, with Cavani taking the spot-kick and missing the target. When asked about the incident, Emery’s response was to let the players sort it out. From that point on, he had lost the dressing room. 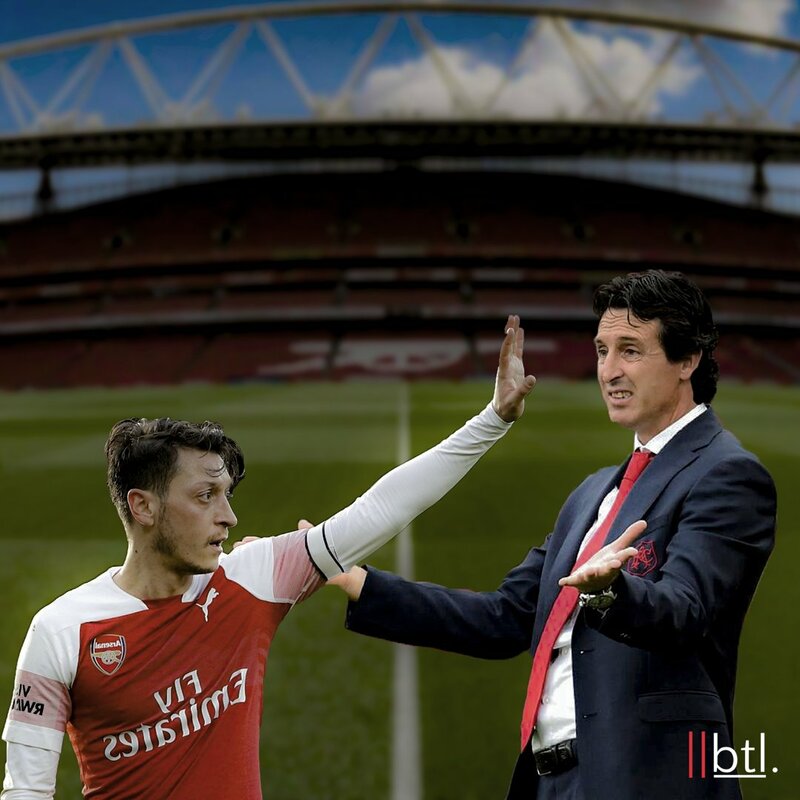 Emery didn’t want to embark on the same path that led to his downfall in France, so he singled out Mesut Özil upon arrival, and since then, he has isolated him, attempting to convey an “us vs. them” storyline against the mercurial German. However, unlike Neymar, Özil has never had an ego, he has never challenged the manager’s authority or stirred up trouble in the dressing room, and he has always wanted what’s best for the club. Since signing for Arsenal in 2013, he has consistently maintained his affection for the north London outfit. So, just why did Emery choose Özil as his scapegoat? Emery has claimed he has left Özil out various of match-day squads for “tactical reasons,” but that’s a farce. He might believe that Özil wouldn’t fit the system, but that’s ludicrous as well. On his day, Özil is absolutely mesmeric. His ability to take up positions between the lines and exploit half-spaces allows a smooth transition between midfield and attack. Unfortunately, he’s not a workhorse, which is what Emery prefers. The club is now taking a financial hit because of Emery’s ego and inability to fine-tune his system to incorporate the German: Özil takes home £350,000 a week despite being a glorified squad player. Emery is right: money can’t be used as a barometer for performance levels. But there is a reason why Arsenal decided to give Özil such a massive deal: on his day, he is one of the best playmakers in Europe. If the club is aiming to finish in the top four, then they need to incorporate all of their four best players in the same line-up: Aaron Ramsey, Alexandre Lacazette, Pierre-Emerick Aubameyang, and Özil. Perhaps Özil won’t aggressively press as soon as the ball is lost, but he’s capable of carving apart even the tightest of defenses. Emery cannot simply throw on Özil and Ramsey when they’re chasing a win: that’s not insightful in-game management, that’s lazy, predictable, and reactive coaching. He can’t just throw them on together for the sake of winning, but shouldn’t Emery find a system that allows the four of them to show their best qualities? With Aubamayeng’s finishing, Lacazette’s hold-up and link-up play, Ramsey’s box-to-box abilities, and Ozil’s creativity, there’s more than enough pieces to play attacking, free-flowing football, which is Arsenal’s identity. Instead, Emery has gone for a pragmatic approach, which hasn’t worked either. Even against weaker opposition at home, Emery has opted for three defensive midfielders, none of whom can play as a #10, or pose any real attacking threat. This has lead to boring, unimaginative football. Maximizing points against smaller teams should be the goal; no matter the opposition, every point counts towards Champions League qualification. Realistically, Emery’s team was going to struggle against the “Big 6,” but this doesn’t his excuse his conservative approach against mid-table, bottom-tier teams such as Cardiff City. As Arsenal attempt to close the gap and finish in the top four, they should take inspiration from their dismantling of Leicester City in October. There was a ruthlessness about the match that Arsenal needs to harness for the rest of the season. That attacking display is what Arsenal Football Club is all about: free-flowing football, exquisite goals, and an assured dominance over the opposition. In that victory, Özil delivered one of the finest individual performances of the season, showcasing his magic in every touch. That’s the identity of the North Londoners. It’s been half a season, and Arsenal supporters are still wondering what the new style-of-play is supposed to be. There seems to be no identity, vision, or progress. New managers will take time to implement their system and style of play, and that’s natural. He still deserves to at least see the season out and implement his ideas. However, Emery is fully deserving of the criticism he is receiving from Arsenal supporters. The Gunners need an identity again, and only time will tell if Emery is the man to implement it.